The Oak Flat Loop is located in the South Rim section of the Black Canyon of the Gunnison National Park near Montrose, Colorado. The trail descends about 350 feet from the parking area and allows one to explore a little bit below the rim of the Black Canyon without actually obtaining an inner canyon permit and hiking all the way down to the river. Although the trail is rated as strenuous it is short enough that it doesn't seem to exact that much of a toll on the body. Finding the trailheads at the Visitor Center isn't all that straight forward at first but if you head to the veranda on the west side of the building you will find a short set of stairs near the far end that leads down to the trails. The Visitor Center usually isn't open until after 8 AM. 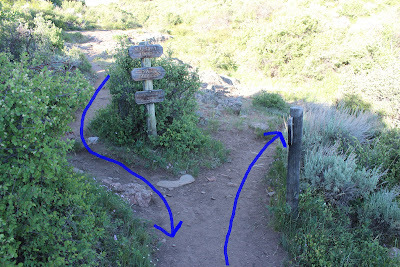 The sign at the trailhead indicates the trail is 2 miles long but the GPS was only showing 1.5 miles and that was from the parking area and not the trailhead. After hiking a very nice trail for less than 2 tenths of a mile through a thicket of Gamble Oak you come to the beginning of the loop. This post describes hiking the loop in the counter-clockwise direction by taking the right fork. Glimpses of the canyon quickly begin coming into view. The trail begins descending rapidly below the rim with an occasional switchback and long sweeping straightaways. The trail is well enough built that footing never seems to be much of a problem. As you hike along various rocky outcrops within the top of the canyon below you become towering walls as you hike down past them. About a half mile into the hike, near the lowest point of the trail, is the fork where hikers with a permit heading down to the river turn off. All inner canyon hikes in the Black Canyon of the Gunnison National Park require a permit. The permits are free and can be obtained at the Visitor Center. The Warner Point inner canyon hiking permit is limited, though, through a lottery system. 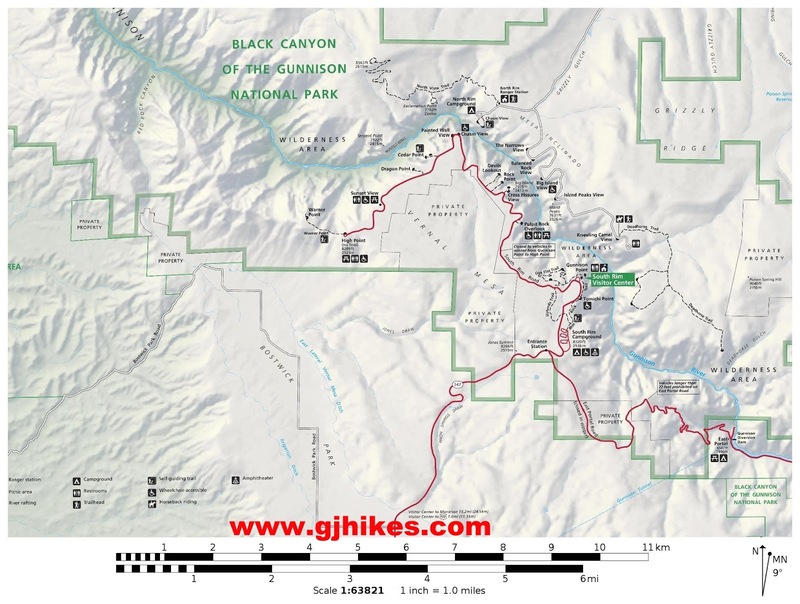 You can get more information on inner canyon hikes on their website. Shortly after the river access trail breaks off the Oak Flat Loop turns west and begins climbing back up to the rim. The ascent is spread out over nearly twice the distance than the trail coming down was making it much more gradual going up. Maybe that is why it didn't seem as strenuous as it would otherwise be. The coniferous trees along the trail are Douglas Fir. The surefire way to identify a Douglas Fir is by the bract scales on its pine cones. 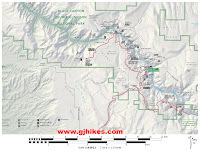 For much of the hike views into the canyon are obscured by the trees and bushes but there are several places where you can get a good look all the way down to the Gunnison River. There are 3 major hydroelectric dams upstream that control the flow of the river. Because of the settlement of the water, especially in the Blue Mesa Reservoir, the water flowing through the Black Canyon is always clean and green. As the trail loops back toward the Visitor Center it passes the beginning of the Uplands Trail. Deer are a common site in this area. If they aren't browsing around the campground or walking down one of the trails they can probably still be seen or heard in the nearby brush. The Black Canyon of the Gunnison National Park is remote enough that visitors don't really start showing up until after about 10 am. There are 3 campgrounds on the South Rim and another along the river at the East Portal just below the Crystal Dam and at least 1 campground on the North Rim. You can pretty much always count on finding a spot to camp without a reservation even on holidays.The Oak Flat Loop trail is a great hike and a very pleasant way to spend some of your time in the park. If you would like to see it for yourself then all you have to do is 'Take a hike'.